tutorial had its last question removed almost two days ago (i.e., past the 1 day period for automated tag deletion). tutorials had been synonomized with it. Typing "tutorial" into the search box on the tag page shows tutorials as an empty tag, the only one of the pair still remaining. Clicking on that opens a page for tutorial, still apparently bound to its mortal coil by the synonym. How do we break this link so the spirits of both tags can move on and find peace? Edit: This issue appears to be more generalized than this one tag. For example, the google tag was cleaned out on September 16. A short time ago, a new collection of questions with the google tag was cleaned up. Linking to the tag used shows that it is the old tag, with the old "Do not use" warning. 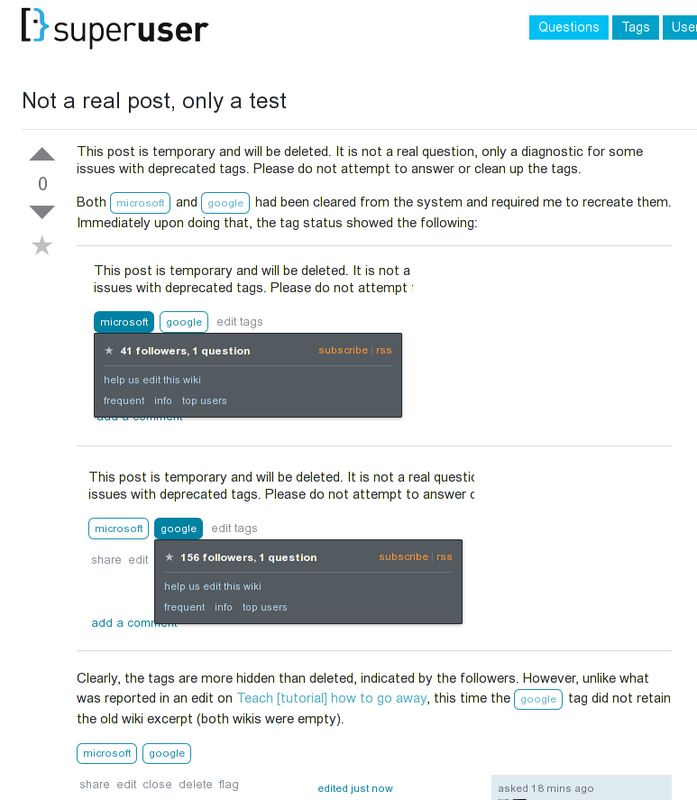 The tag was not recreated, the system failed to delete it. This appears to be the same thing going on with the microsoft tag (The monster that can't be killed). It looks like there is a general problem with tag deletion, and the synonym on the tutorial tag is probably just coincidence. This isn't really an answer, just a place to post some experimental results that might shed some light for anybody more familiar with the inner workings of the system. The following is a screen shot from an experiment on SU. I temporarily posted a question with the deprecated microsoft and google tags, as mentioned in the edit on the question above. Not the answer you're looking for? Browse other questions tagged discussion tag-cleanup-request . Mechanism for scrapping bad audit questions?